At WTC The Hague sustainability is one of our key values. Read more about how we contribute towards a better environment. 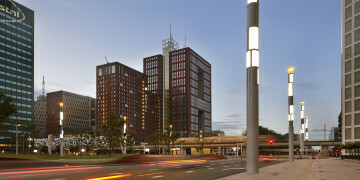 At WTC The Hague, sustainability is one of the key values. We have, for example, an energy label A, a thermal energy storage system and we work with a healthy indoor climate, class B. This has been the reason that we, as the first multi-tenant building in the Netherlands, were granted the BREEAM-NL-In-Use Excellent certificate. In short: the climate control regulation and energy supply of our buildings are of the highest standard. But we also look beyond our own building. We are involved in other activities, outside the WTC. These include our clean water project Join the Pipe, our participation in a pilot for shared use of business cars, and throughout the year we work closely with the Green Business Club.